I hope I'm not giving out too much misinformation. If anyone catches some errors I made in my understanding, don't hesitate to correct me there or here. If by fun you mean a complete waste of anyone's time to read, then I agree with you. "I forget who it was that figured this out, some famous guy I bet, but here goes. A mass twice the size requires twice the energy to stop. I'm sorry Patrick but I'm absolutely right on this one. You know what would be cool though is if you started to argue against the Laws of physics, that they didn't apply to biology and whatnot." Last edited by Nacho : 11-03-2010 at 01:00 PM. Well it's fun for me, in a weird way I guess. I don't think I will succeed in making him see, but we never know. The problem is you're dealing with someone, like Hahn, who will completely ignore something even if a fact is staring him straight in the face. One time Hahn said that protein causes insulin secretion because it is converted to glucose, which in turn causes the insulin secretion. I then showed him a study showing amino acids to directly stimulate pancreatic insulin secretion. He completely ignored that and repeated the same mistaken belief. Levac does the same thing. It makes discussion impossible. That's why I don't bother getting in extended discussions with people like him. 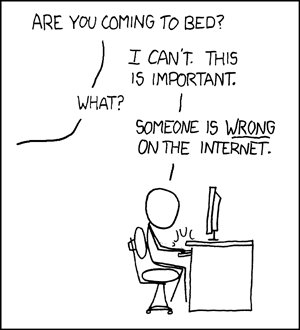 Arguing with a zealot for several pages on an internet forum instead of catching some sleep, doing some work, or even foam-rolling with a cactus is an error. That said, it was Krieger's back-and-forth with Drew Baye and Fred Hahn and Ben Fury's interweb fights with Drew Baye that helped temporarily dislodge my head from my backside with regards to the 'supreme efficacy and safety of HIT (especially slow HIT) for all people at all times.' Gaining more mass with other terrible programs helped, too. Still have no idea I dropped the 'carbohydrate hypothesis.' Probably happened when the weight loss ground to a halt, but not sure. I got sucked into an argument with a low carb zealot, he kept using anecdotes about how he could 'eat as much as he wanted and lose weight effortlessly' while low carbing, and while I said I'm glad he found a diet that worked for him, it worked because of protein satiating effects, limiting food choices and the fact he (by his own admission) was eating 10cal/lb and had started exercising too. He then said the cals/lb were irrelevant because he could eat the same amount of calories with high carb and not lose weight, or double the calories with low carb and not gain weight. Something about insulin fairies. He also seemed to think the only 3 diets in existence were atkins, vegan and the food pyramid. Any moderate carb or diet involving meat and vegetables seemed impossible to him. This went on in circles, he kept quoting studies with mice using insulin injections, or humans on insulin suppressing drugs, and I tried to explain to him that it's not the same as eating a low carb diet, then it got into him saying how strong he had gotten using superslow/slowburn whatever crap it's called because he wanted to look jacked like fred hahn , then he started quoting gary taubes and that when I finally realised it was time to leave. Just like what Lyle said, "facts won't change beliefs."